As I am writing this, Vicki and I are headed back to the panhandle of Texas from our time in Maui. We were able to slip away for a short time and enjoy visiting with some of the folks we have come to know in Maui as well as meet some new friends that knew Joshua and Danielle when they lived in Maui. The weather this trip was really interesting. The Kona winds blew in and were really strong (not as strong as winds in the panhandle). This brought in some pretty strong swells, some higher humidity and what they called vog. Vog is their term for when the volcanic ash is caught in the wind and blows across the islands. This traps the heat which combined with the humidity brings some pretty tough weather. When you go to the beaches that we went to they would have lifeguards there. Kamaole 1, 2 and 3 along with Big Beach had lifeguards standing ready to handle any crisis that might arise because of the dangerous swells. They would be watching the beach at all times, make announcements when they felt that the danger was to great for people to get into the water and even posted signs warning of the danger. One morning the lifeguard put out a sign near where we were sitting. The sign said  WARNING! Dangerous Shorebreak even in shallow water waves can be dangerous. 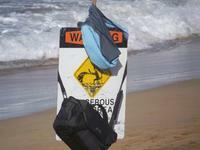 If in doubt, dont go out. A family came onto the beach and set their chairs down near one of the signs. The man set about taking pictures of his grandkids and kids. It was pretty neat. But then it happened. Some one asked to take his picture. So he took his camera bag and hung it over the sign covering up the bottom part of the sign. Then he took off his shirt and hung it over the sign and covered up the top part. For all practical purposes the sign was no longer serving its purpose. It was a stand to hold a camera bag and a shirt. I took a picture of it and have it posted on our web site  www.hbcpampa.com so if you want to see it you can. But what this article is really about is that God has put up a warning sign for the world to see. He has shown us in His Word, the Bible the dangers of not accepting Him as our Savior. He has shown us that to believe in Him is to live eternally but not to believe in Him is die separated from Him. The warning sign is when we love the darkness more than the light. It is about the power of sin to keep us from being all that God would have us be. God tells us that because of our sin we are separated from Him. The ultimate price of that sin is separation from God for eternity. Scripture tells us that if we will believe in our hearts that God has raised Jesus from the dead and confess with our mouths that Jesus is Lord, we can be saved (Romans 10:9-10). Yes, the Bible in John 3:16 (and many other places) tells us of Gods great love and desire for us for which I am eternally grateful. But Scripture in John 3:19 (and many other places) also warns us of the dangers of turning from His love, mercy and grace. I love to tell the story of how Christ loved us and gave up the glory of heaven to become like us so that He might provide the way of salvation for mankind (Philippians 2:5-11). Yet if I am going to tell the entire story, I must be sure to tell that one cannot enter into heaven except by Christ. In John 14:6, Jesus said, I am the Way, the Truth and the Life. No man comes to the Father, but through Me. But I wonder -- Are we telling the entire story? Do we cover up part of the warning so it doesnt sound so harsh? When that man covered up the sign, people saw a camera bag and shirt. Then looking beyond they saw the sandy beach, the waves coming in and people going into the ocean. Yet the danger was still there. Do we put so many things over the warnings of God that people only see the beauty of knowing Christ, but not the dangers of turning away from Him? The question that I asked myself on the beach that day was this --- Am I covering up the warning signs of Gods Word with the very things God has given to me? It may very well be the question that you need to ask yourself today. God does love us, but He also expects us to faithfully and obediently follow Him. While visiting the beach, we must remember that the shore breaks can come quickly so if in doubt, dont go out. While walking through this life we must remember that Christ is coming quickly, so if in doubt, dont go out of this life without Him. Trust Him to save you today.